Special thanks goes to Maciej Prochniak for contributing the visualization of the current activity in Activiti Probe. Also I wish to thank Christian Muelder for being available on a saturday to fix our hudson coninuous integration box hosted by Next Level Integration. Camunda has received excellent feedback on their Activiti training. We recommend it! 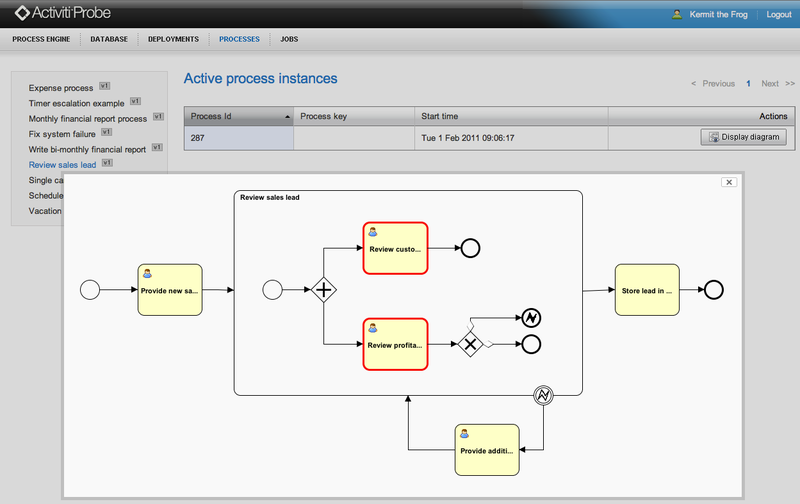 Such examples with diamond markers on sequence flows originating from gateways is not allowed in BPMN. No known BPMN editor will add that marker automatically, and a manually added marker should be caught by diagram validation. @Steinar: that is indeed a bug in the diagram generation code. The Activiti Modeler and Activiti Designer does NOT have this behavior by the way. I created a Jira issue for it and it will be fixed in the next release: http://jira.codehaus.org/browse/ACT-598. Congratulations! Great job and well done Activiti team! Thanks for this fast release. This version is far better than jBPM. 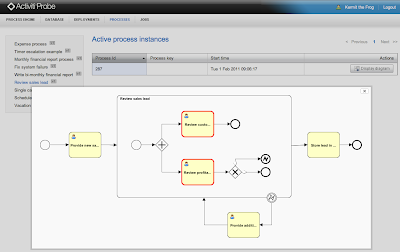 Hope you continue developing Activiti Ecliplse plug-in as it is the basic tool for final workflow development. @Steinar, thanks for the constructive feedback so that we can make Activiti better every day. @Lim @Pau, Thanks for the flowers!